Many Mario Karts later it can be a little disorientating to go back to where it all began. Each cup has five races. Laps are short, but there are five of them. Item boxes are squares laid flat on the ground and put out of use after you've run over them. The CPU characters don't collect items at all, but have a single special ability they can call on during the race. 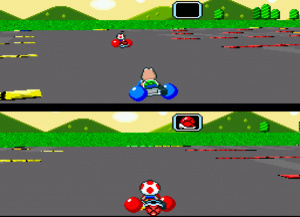 Those are some of the differences between Super Mario Kart and later games, but it still provides the fun and frantic racing action the series is known for. Now available for New Nintendo 3DS you can enjoy this wonderful racer whilst out and about; the suspension/restore point functions coming in handy if you do not have time for a full cup of races. The Mode 7 visuals are very effective, making you feel like you are throwing your kart around corners or narrowly avoiding perilous drops. 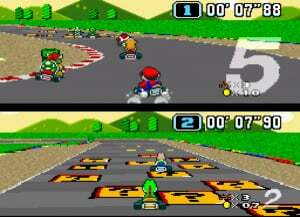 The clean designs of the racers stand out from the tracks, stopping things from blending together; good when the action is now being viewed on a smaller screen – a smaller screen split in two. With only half the screen used for displaying the action (the other usually shows the map) this could cause problems, but thanks to a sensible camera position the racing remains clearly visible; in truth most other racing titles would just use the extra space to show more sky. Though shrinking the screen further, this re-release includes the standard (for SNES on New 3DS) original resolution mode that can be switched on in the Virtual Console options to make the visuals sparkle that little bit more. One thing there isn't an option for, however, is multiplayer. Sega 3D classics let you connect copies of certain games for multiplayer shenanigans, NES Virtual Console titles go with download play to provide fun with a friend, but for SNES titles you're on your own. The multiplayer modes can be selected and (by holding the Z buttons and tapping Y) you can switch "controllers", but there's no way for simultaneous play to occur. This is disappointing when multiplayer was a big part of Super Mario Kart's appeal, whether using help to obtain gold in the cups, racing each other or battling away in the highly enjoyable Battle Mode. 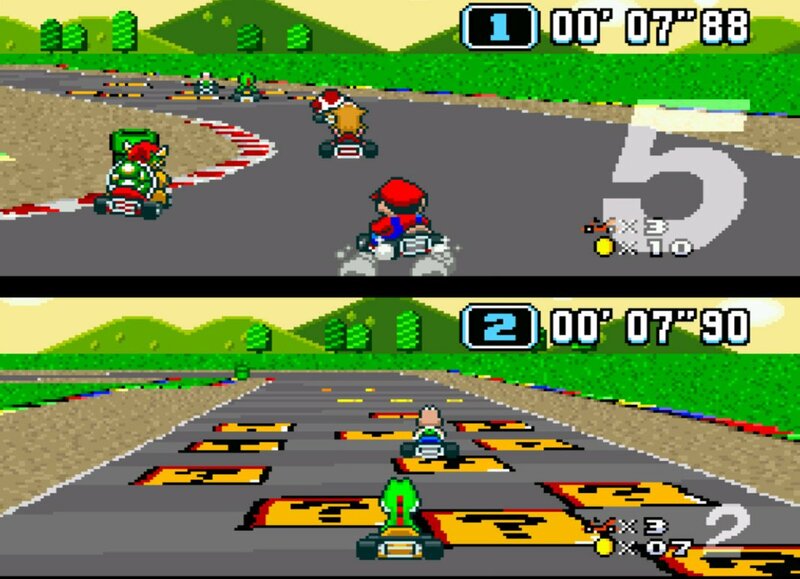 As a release for a portable machine, multiplayer is something unlikely to be used as frequently as on a home console, but if you do bump into a New 3DS-owning chum it's a shame you can't join up for some retro karting action. The single player mode is still as enjoyable as it ever was with twenty tracks to get to grips with. 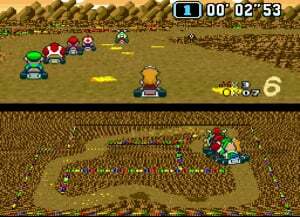 With the traditional-style Mario Circuits, the right-angled turns of the Bowser Castle tracks or something a bit different like the Koopa Beaches, there are a lot of memorable tracks here that bring a smile to gamers' faces whenever they return in later Mario Karts. Of course if you have an ambassador copy of Mario Kart: Super Circuit transferred to your system, the tracks are (unlockable) there, but these are the original versions with their original obstacles and zippers in place, and there's also the feather available for avoiding danger/taking shortcuts too. Playing (and replaying) through the various cups is a lot of fun and can sometimes be a bit challenging; the CPU characters' repeated use of weapons can feel unfair at times. Luigi in particular is a complete git who will turn on his invincibility whenever he gets near. Races can be tight affairs or - if you get good at a track - you can find yourself lapping the field like you're Ayrton Senna in the XXXVIII Sega European Grand Prix. If you'd like a different (more challenging) way to play Nintendo Life recommends pressing the Y and A buttons together on the character select screen. Finally, the Time Trial mode is as addictive as it's ever been as you try desperately to improve your time by a small fraction. Thanks to Miiverse integration you can also post your time to see how you compare with other owners of the game. Spoiler alert: you're not as quick as Sami Cetin. It's Mario Kart, but not as we have come to know it. There are differences but in truth only the CPU characters' use of special items is an issue. There's a lack of multiplayer - the Wii U iteration naturally has this included - but plenty of highly enjoyable single player racing action with a fun GP mode and the time trials. There have been other Mario Karts, but the original still provides good entertainment and is a game you'll enjoy returning to again and again. It's always a shame the game used so little of the screen for single player racing. The lack of multiplayer makes this one feel like a wasted opportunity. Still my favorite in the series, mind. One of my favorite in the series. It gives the 'kart' experience with small and well designed tracks (for most cases), which is fun to race around in 150cc with the fastest characters (Bowser and DK Jr.) once you learn how to control them. Not to mention, making custom tracks for this game is a delight. Too bad it doesn't have multiplayer. @Scapetti: Perhaps. Just thought it looked a bit odd. Rose-tinted glasses are a must for this one. 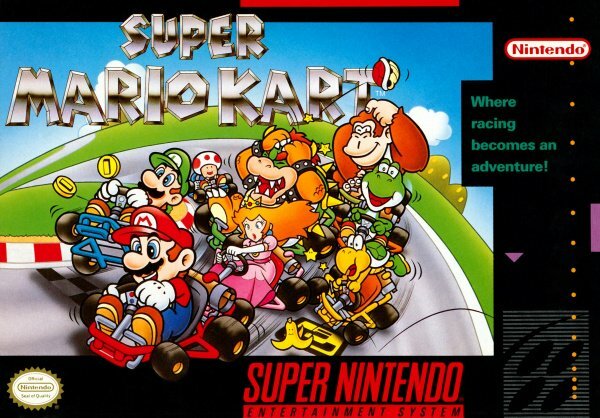 It was impressive for its time, but it can be a headache if you're used to modern Mario Kart. It's a shame there's no multiplayer. This is fair score, never really enjoyed the snes version nearly as much as the 64 even on original hardware. A classic, but one that has not aged well. @Fuz off topic, but love your avatar, I though I was the only one who remembered creatures ! Ok I gotta say it- this is a huge disappointment. Not only should this game have been reworked to place bottom portion of split screen on bottom screen of 3DS, and top portion on top screen of 3DS, this REALLY needed download play MP. Battle mode of SNES was the best part! To be able to relive that anytime, anywhere with my bro on his 3DS would have been amazing. They should have invested the time to make this a star release. They could have charged more for it, like Earthbound. I'd rather pay an extra few dollars and get something amazing. @JaxonH: apparently, you didn't grasp the concept of the virtual console. What you're asking for is a full remake with nothing in common with the original code, what's the point since the series is still going? As far as I'm concerned the original Mario Kart doesn't hold up anywhere near as well as the original F-Zero. The game ain't bad, but these days it's not quite as great as it once seemed imo. And, I generally prefer the more pure skill based gameplay of F-Zero anyway, rather than the half luck based gameplay of Mario Kart. Still, it's just nice to have it on New 3DS, but it's a shame Nintendo didn't really bother (not including the multiplayer, one of the original game's most important and loved elements, is testament to that fact). @Simbabbad You're right, but not including the multiplayer mode really is a sin (and just half-*ssed and lazy as hell on Nintendo's part). Apparently, you didn't grasp the concept of "releasing games that are actually worth buying again"
Without MP download play, 3/4 of this game's purpose of existing is stripped away, right from the gate. And the split screen is not suited to handheld play where it's such a small screen. But wouldn't ya know, Nintendo put a 2nd screen on their handheld. Amazing. So games like this, that have a screen which is super condensed by being split in half and being on a handheld, could easily take advantage of that to make a game worth owning. If it ain't worth buying, it ain't worth releasing. And this game, as it stands, ain't worth buying (not on 3DS anyways). @617Sqn They should have had the Creatures games on Wii C64 Virtual Console! Too bad. @JaxonH I agree that it wouldn't be too much work for Nintendo to get their SNES emulator to output the top half of the image on the top 3DS screen and the map on the bottom screen. It would probably look a bit low-res stretching half the image to fill the top screen but it would definitely be a more sensible use of the screen real estate. 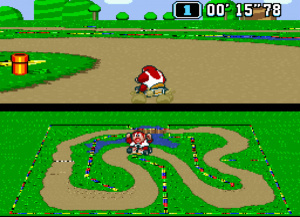 Bleck, split-screen on a handheld. No, thank you. This is def a fun game and packs a lot of content (tracks and modes) for what you get. I'm surprised by the score. Even with my nostalgic connection to this game I'm very hard pressed in justifying any score above 6/10. I can only image how people with 0% Nostalgia level feel. 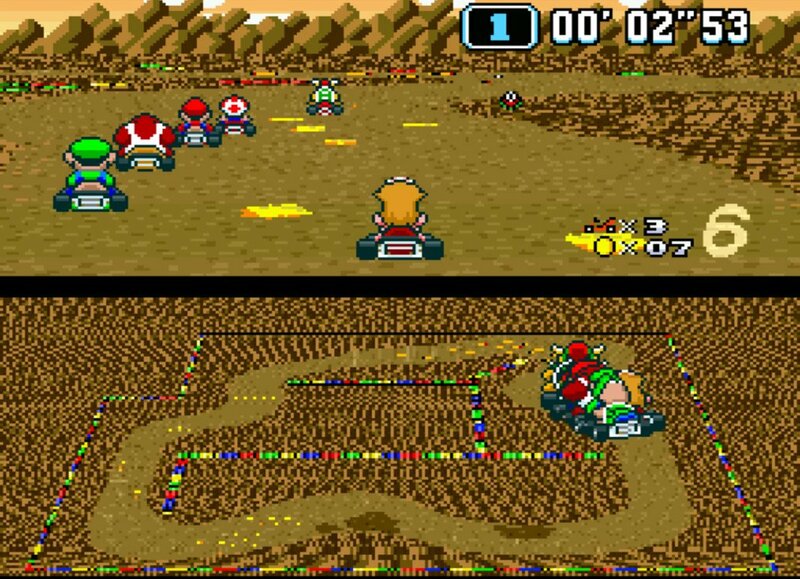 The Wii U version of Super Mario Kart is better! And this game is awesome! It's the best Mario Kart in one sense: it's the most racing game and the least party game. I hope Mario Kart goes back to racing. So glad I didn't jump in and buy this. I was thrilled at the thought of getting hold of a version of the original kart. But lack of multiplay makes it unappealing. Shame. @SamiCetinSMK Hey, thanks for the info! 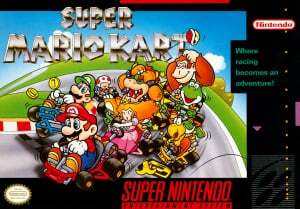 My favourite Super Mario Kart track? Difficult question. It can be Rainbow Road, Ghost Valley 2 or Vanilla Lake 2! @VanillaLake Ghost Valley 2 is superb aswell for keeping on the edge, we also like Ghost Valley 3 as you can do pretty cool gap jumps (as per Vanilla Lake 2). Are you based in Ireland? Just wondered if you had a PAL SNES console and Super Mario Kart, I could find out where you would rank Nationally as well on Time Trials. I rented this game so much on SNES that the shop should have just given me the cartridge. Donut Plains in particular sends me into raptures of nostalgia. But I don't think it has aged well. The slippery steering feels like you are rotating the course itself rather than your character (which I believe is also what technically happens). Meanwhile, I'm still baffled that there's no cross-play for SNES VS games. If I knew they were tied to my NNID account and playable across systems, I would have bought ALL of them by now. I don't have a SNES any more. Currently, I play Super Mario Kart on Wii U and still trying to be half as good as I was when I was a kid. Ghost Valley 3 is cool, too, but I need to memorise all those gaps again! @hefferj No cross-play and no cross-buy. Nintendo is stuck in the past. 0:44 jumping is risky! Good job! Wish they could've made this 8 player online!!! Would be incredible .... always loved the handling in the Snes game better than any other. Would be great multi-player with no rubber-banding!!! Sure it won't be the same if you've played the modern ones first but I loved the smaller courses and tighter corners .... Rainbow Road 150CC ... once u master the cornering ... is a walk in the park! Toad was always my fave character in this one!!! @JaxonH this is why I find the GBA Mario Kart superior , not only has it very colorfull detailed graphics it also has the full SNES set of tracks and none of the half screen nonsense. This game is a true classic and I still play it on my snes from time to time. Wish the series would go back to the way the competitive balloon fighting was in this game, instead of the way it is in Mario kart 8. The 3DS version is more expensive than the Wii U version and lacks multiplayer? no way, i continue with Wii/Wii U version.